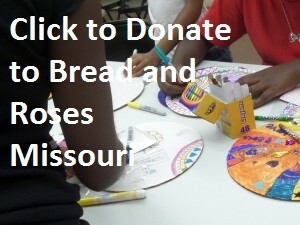 Mission: Bread & Roses Missouri uses an arts lens to examine social and economic justice issues in all our programming. We believe that cultural and creative expression are a means to affect deep and lasting social change. We accomplish our mission by organizing and participating in arts and humanities events, exhibits, and workshops for and about workers and their families that address the root causes of poverty and inequality, and that move us toward an economic base that benefits the entire community. All proceeds benefit Bread and Roses Missouri! Making a Single or Sustaining Contribution? 1) Online: Click on the image or this Online Donations link to make a secure online transaction using your credit card, debit card or Pay Pal account. 3) Direct Bank Debit: If you do not wish to use a check, credit card, debit card or Pay Pal, please instruct your financial institution to set up a single or recurring payment from your checking account in the amount, frequency and duration of your choice. Simply provide them with our organization name and contact information as shown above. Watch our Facebook Event page for our next performance schedule! To buy event tickets online, please navigate to our Events & Performances page.